Discussions are on with the Russian side, including with its leading bank in India, Sberbank, but a solution is yet to be found. Financial sanctions by the US have hit India’s arms trade with Russia hard, with payments for weapons and equipment worth over $2 billion stuck after banks refused to make remittances to Moscow fearing penal action. With Russia’s flagship arms trading company Rosoboronexport coming under sanctions by the US Office of Foreign Assets Control (OFAC) last month, almost the entire arms trade with India has come to a grinding halt after the State Bank of India put an immediate stop to all payments from April 7. Consultations are on at the very top levels of the government to resolve the issue, given that critical arms acquisitions and ongoing programmes including submarine building and repairs, missiles and warships cannot move unless a route is found for the remittances. US sanctions forbid any business ties with entities designated as Specially Designated Nationals (SDN). The penalty for violation could result in closure of all operations with American concerns. This has forced Indian banks to freeze all lines of credit (LoCs) to Russian arms companies. Payments worth over $100 million have already been blocked in less than a month and the issue will impact trade of over $2 billion in the coming months if not resolved. An Indian public sector bank that was used for making such sensitive payments in the past is being roped in, sources said, but the recent tightening of norms by the Reserve Bank of India (RBI) following the Punjab National Bank fraud is coming in the way. Discussions are on with the Russian side, including with its leading bank in India, , but a solution is yet to be found. Alternative arrangements are also being looked at, including feasibility of the creation of a specialised bank for defence-related payments. Queries sent to the defence ministry and the State Bank of India were not answered as of press time. Resolving the payments route is top priority, with the matter being taken up by top government officials, including the Prime Minister’s Office (PMO), sources said. The magnitude of the payments can be judged to be critical given the type of programmes that can get stuck. 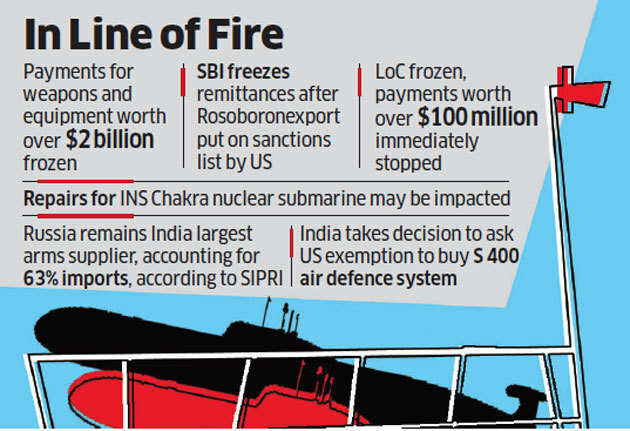 For instance, the sanctions listing has hit payments to the tune of over $15 million to Russia that would have been used to repair the damaged INS Chakra nuclear submarine that met with an accident in late 2016. The Chakra, which was taken on lease from Russia, damaged its sonar dome and has been non-operational as specialised repairs have to be carried out. The Chakra is India’s only nuclearpowered attack submarine. On a separate note, a decision has also been taken at the top level of government to request Washington for a waiver from the Countering America’s Adversaries Through Sanctions Act (CAATSA) for a deal to purchase the advanced S 400 air defence system from Russia. The proposed $5.5-billion deal is critical for India, which is looking to plug gaps in its air defence network. While arms trade with Russia has been on a decline for the past few years, it remains India’s largest weapons supplier, according to Stockholm International Peace Research Institute (SIPRI) data. In its latest report, SIPRI lists Russia as India’s top weapons supplier accounting for 62% of all arms imports in 2013-17. It also lists India as the world’s largest importer of weapons, above Saudi Arabia.